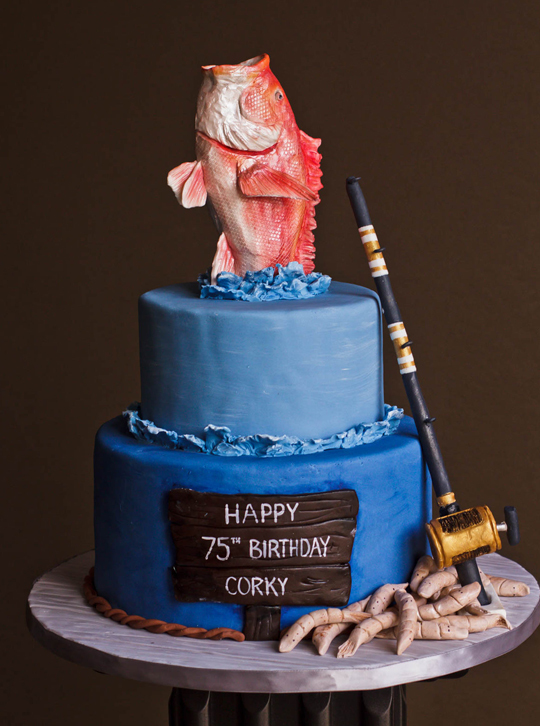 This summer we were asked to make a deep-sea fishing themed cake. None of us in the cake crew are avid fishermen. Or any kind of fishermen for that matter. So after saying yes, we did a little research on the topic. With the request of a red snapper fish in hand, we went off to work. What do they look like? Well, they’re beautiful white and red glistening creatures that, according to some excursions, can be at least 20 pounds! Sounds like a lot of fish to me but I bet in the world of deep-sea fishing, that’s pretty small. While we wanted our fish to be lifelike, it certainly couldn’t be that large. Katie set out to make our fish starting with one large block of white modeling chocolate. 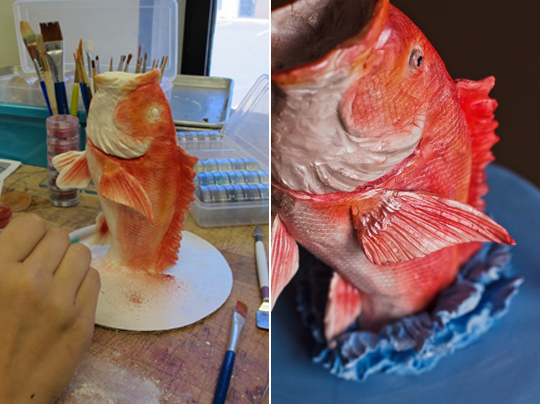 After a couple hours of molding, shaving, carving, and dusting, a red snapper was born. It’s amazing seeing these forms come to life. Next came the extra fishing elements. Did you know that live bait is best while deep-sea fishing? No fake flies for these guys. You have to give them something they actually eat. In this case—shrimp. So Katie literally made a pile of small, chocolate shrimp (without the beady looking eyes!). All hanging out ready to be baited onto our specially designed, chocolate, deep-sea fishing pole. Now for those extra details that really make a cake shine. 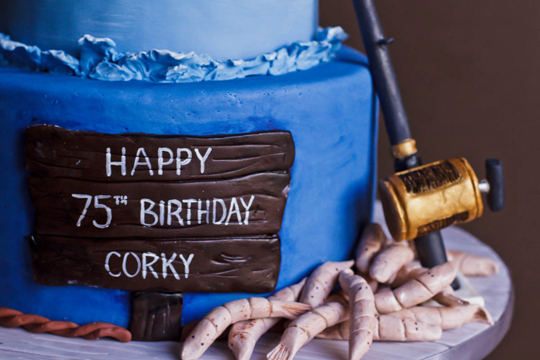 Since everything was fishing themed, we couldn’t just write a simple inscription onto this cake…that would be unacceptable! 75 years calls for an attention-grabbing sign. In this case, a slightly eroded and grooved wooden placard. Next came the woven rope border, as every good fisherman should have some rope (…right? We think so.) The molded waves surrounding both the top tier and the fish were dramatically shaped out of white chocolate. And lastly, our worn and weathered gray cake board resembling a washed out pier. Life is in the details, right? And here’s an interesting tidbit for you. This customer came to us because they were at our carnival man Jim’s birthday party (check out his cake: big top). 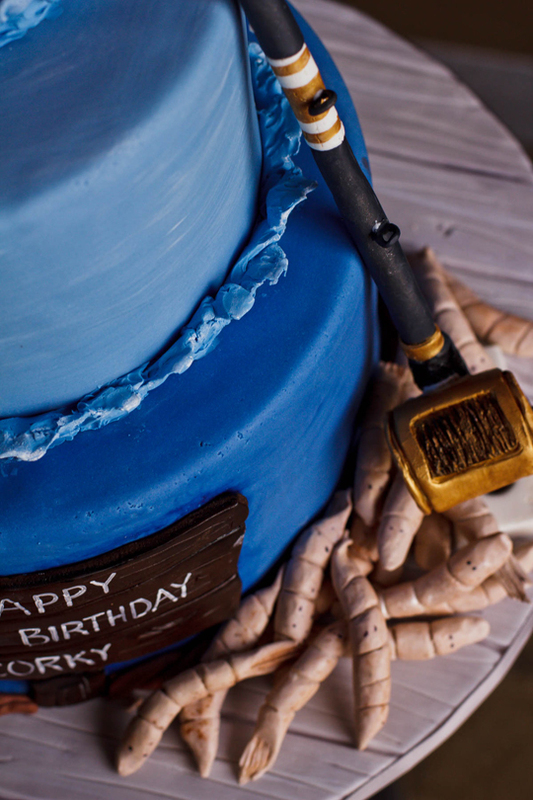 They saw his carnival-themed cake and wanted something just as cool. We were happy to oblige.